The Oregon Humane Society trains veterinarians in the field of shelter medicine through internship and resident programs. OHS interns perform a variety of tasks, including shelter consultations, both on-site and off-site. If you are a veterinarian or sheltering professional and you have a question concerning Shelter Medicine, please email us. Please note that we are not able to provide treatment advice nor answer specific medical questions unless you are a veterinarian working in a shelter or providing assistance to an animal shelter. Please give our intern up to one week to reply to your question. Thank you for your understanding. On July 1, 2017, after a year as the Shelter Medicine Intern, Dr. Victry Mueller transitioned into a new position as Shelter Medicine Resident. OHS hosts a Shelter Medicine Residency that is approved by the American Board of Veterinary Practitioners (ABVP) Resident Program. Dr. Mueller will complete her three-year residency training in July 2020. The residency program includes clinical time at OHS, specialty practices in the region and beyond and a broad number of required shelter consultations and visits over the course of the three years. Dr. Kris Otteman of OHS, in partnership with Dr. Helio deMorais of Oregon State University, are the designated advisors for the residency. 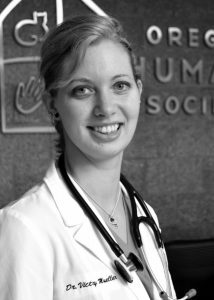 Dr. Mueller is from Los Angeles, CA and completed her undergraduate at UC Berkeley where she discovered her passion for shelter medicine. She moved to Columbus, OH to attend The Ohio State University and obtained her Doctorate in Veterinary Medicine. Dr. Mueller lives in Portland with her fiancé, two dogs and a pet ball python. Dr. Mueller plays the piano and has recently taken up gardening. The Shelter Medicine team is pleased to have Dr. Mueller continue on with the OHS Holman Medical Center. She will continue to develop her skills in this specialty, which requires a broad range of expertise from the physical and behavioral health of shelter animals to the environmental health of the shelter facility. Dr. Emily Ferrell succeeds Dr. Mueller as the current Shelter Medicine Intern. Dr. Ferrell is originally from Pompano Beach, Florida; however, she spent her last few years in Gainesville where she graduated from the University of Florida’s College of Veterinary Medicine. 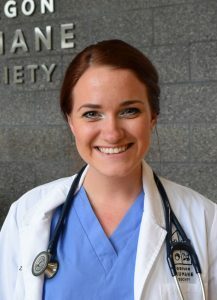 She is pursuing a career in shelter medicine with a special interest in forensics and cruelty investigations while completing her master’s degree in veterinary forensic medicine. The shelter medicine internship program offers training for veterinarians interested in this exciting new discipline. Under the supervision of Dr. Jacqueline Blanchette, Lead Veterinarian, the intern completes a one-year training program. Comprehensive veterinary care of shelter animals requires—in addition to a strong foundation in clinical veterinary practice—a focused expertise combining elements of preventive medicine, epidemiology, infectious disease diagnosis and control, behavioral science, public health, and surgery. In her free time, Dr. Ferrell enjoys spending time with her two cats, and paddle boarding and hiking with her two dogs, a Jack Russell terrier and a Great Pyrenees/Labrador mix. Dr. Ferrell is excited for the opportunity to contribute to the Portland community and grow as a veterinarian. 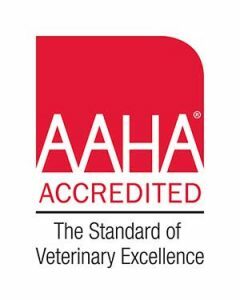 The Oregon Humane Society hospital is accredited by the American Animal Hospital Association (AAHA) and the American Veterinary Medical Association Council on Education (AVMA COE).